Houses & Homes VA: All right, let's clear this up once and for all! All right, let's clear this up once and for all! Many people have asked me what the difference is between a broker, an agent, a realtor and so on. Although we in the industry are quite familiar with these terms they can be somewhat confusing to persons that don’t routinely deal with the real estate market. I thought it would be a good idea to explain what these terms really mean and the differences between them. Agents are the licensed “salespersons” that work for a broker. By law they are required to work under the guidance of an employing broker and the broker is held responsible for their actions. The requirements to obtain a real estate license vary greatly from state to state but will require applicants to be of a certain legal age and to have completed a minimal level of education. Usually one need not be a resident of the state to obtain their license there. 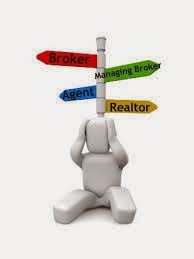 A broker is the person or entity that employs agents and is responsible for their actions (or lack thereof). Normally, a broker is required to have more education than an agent but not always. In some states a 4 year degree may be required along with having completed some additional real estate related courses. In other areas it is possible to obtain a broker’s license without a degree but some experience in real estate as an agent is required as well as having completed a certain number of college level real estate courses. These requirements may be quite different depending upon what state you are employed in but must be adhered to in order to be able to take the exam to become a licensed broker. A real estate broker is not required to hire agents and is able to work independently if he/she chooses. However, most brokers will hire agents as a way to increase business and may employ one or many agents in their area. Simply stated, a broker associate is a broker that chooses to work for another broker. There can be many advantages to this arrangement including the availability of mass marketing, name recognition and an abundance of “leads” or list of interested buyers or sellers provided by the larger brokerage. It is comparable to buying a McDonald’s versus opening your own burger shop. Today however, there are still many independent brokerages to be found that are not part of a bigger business entity. A REALTOR® is an agent that belongs to the National Association of REALTORS® (NAR). Members pay an annual fee for membership and must adhere to a very rigid Code of Ethics to remain in good standing. Realtors can be either a broker or an agent. NAR members also belong to state and local chapters. Many persons consider the title of REALTOR® to be somewhat prestigious and the mark of a true professional in the industry.